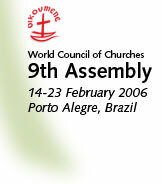 Below is a small selection of articles found in an attempt to gauge the impact in the media of the WCC's 9th Assembly. We have tried to select articles covering various aspects of the event, and a broad range of viewpoints. Since they appeared in independent publications, these articles neither represent nor necessarily reflect the official policy of the World Council of Churches. Ecumenical will meet Evangelical this week as the World Council of Churches holds its largest and most ambitious conference in eight years. Porto Alegre, Brazil (ENI). Christians and Muslims must work together to "put out the fire" created by recently published cartoons caricaturing the Prophet Muhammad, the World Council of Churches' top official has said. PORTO ALEGRE, Brazil (AP) -- Christian leaders opened their most ambitious gathering in nearly a decade Tuesday looking to address the faith's internal rifts and to ease discord with Islam stirred by cartoons depicting the Prophet Mohammed. Leaders and representatives from across Christianity gathered in Porto Alegre, Brazil, Tuesday for official start of one of the most ambitious ecumenical conferences in nearly a decade. The World Council of Churches 9th Assembly promises to provide enough options for the diverse interests of the RCA members in attendance. The World Council of Churches Assembly in Brazil in February gave CWM the chance to hear about what churches are doing about issues of concern in parts of the world not represented in the CWM family. Professor Maake Masango from the Uniting Presbyterian Church in Southern Africa sat on the same panel as a woman from Puerto Rico, who described the affect of America on their identity as similar to colonialism, an issue Africa also faces. (AP) The forces reshaping Christianity come with many names. In Nigeria, the Mountain of Fire and Miracles congregation holds huge all-night revivals. Across Asia, the True Jesus Church preaches biblical interpretations that include shunning Christmas as a pagan-tainted holiday. In Brazil, the Universal Church of the Kingdom of God says rewards spiritual and material may await those who give to its fast-expanding empire. (AP) - The forces reshaping Christianity come with many names. In Nigeria, the Mountain of Fire and Miracles congregation holds huge all-night revivals. Across Asia, the True Jesus Church preaches biblical interpretations that include shunning Christmas as a pagan-tainted holiday. In Brazil, the Universal Church of the Kingdom of God says rewards - spiritual and material - may await those who give to its fast-expanding empire. At a moment when war, violence and poverty engulf much of the world, and when the vision of church unity seems uncertain at best and fading for many, the World Council of Churches is boldly asking God to "transform the world."